The anniversary this week of Malcolm X’s 89th birthday offers us the context to reflect on the life of the man whose activism continues to reverberate around the world. After a youth scarred by trauma, the man born Malcolm Little turned his seven years in prison into a world-class political and religious education. In the Charlestown, Norfolk and Concord penitentiaries of Massachusetts, he joined the Nation of Islam and became a follower of its leader, the Honorable Elijah Muhammad—who personally corresponded with Malcolm—and came out of prison on Aug. 7, 1952, a new man. Malcolm abandoned his “slave” name in favor of “X” and began a bruising political and spiritual quest that would make him the most authentic working-class leader that black America has ever produced. Between 1952 and 1965, he organized Muslim mosques and secular political groups in the United States and around the world. He emulated the street speakers he encountered as a young man in Harlem, and his trademark speeches distilled the black-liberation movement to its essence. 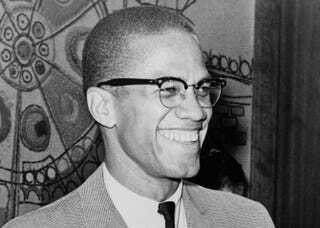 As a young activist in the 1950s, Malcolm helped transform the NOI, turning a small religious sect into one of the most important black organizations of the 20th century. Outside Baptist churches and Harlem storefronts and speaking atop stepladders, Malcolm went “fishing” for new recruits. He told working-class blacks that they were a proud people whose history had been distorted and defamed by white supremacy. Malcolm chided black folks for sleepwalking through one of history’s most important epochs: the global revolution being waged by indigenous groups in Africa, Asia, Latin America and the Caribbean. As black America’s unofficial prime minister, Malcolm grew in notoriety as a speaker, political leader and radical activist. Mainstream journalists depicted him as Martin Luther King Jr.’s sinister counterpart, but this portrait ignored the fact that both men were black revolutionaries. Malcolm criticized the Southern civil rights movement’s strategy of nonviolence as ineffective—even foolish—buoying his standing with militant students. When Fidel Castro came to the United States in 1960, it was Malcolm, not King, with whom the Cuban revolutionary conferred. By the next year, Malcolm’s revolutionary status had been solidified as he delivered jaw-dropping speeches around the country, debated civil rights activist Bayard Rustin at Howard University and offered emotional support for activists protesting the murder of Congolese Prime Minister Patrice Lumumba. “If you’re afraid of black nationalism,” Malcolm observed, “you’re afraid of revolution. And if you love revolution, you love black nationalism.” His outlook: African Americans could not afford nonviolence “when your churches are being bombed” and children murdered. The speech touched upon domestic and international anti-colonial struggles and laid out the blueprint for a global revolution that Malcolm would not live to see. After being suspended from the NOI, the result of a power struggle within the group, Malcolm carved his own path. In less than one year he created two organizations, traveled twice to Africa, embarked on a hajj to the Middle East and claimed the name El-Hajj Malik El-Shabazz. His assassination on Feb. 21, 1965, at the Audubon Ballroom in New York City’s Washington Heights neighborhood ended only one chapter of his remarkable life. In death, Malcolm became larger than he had been in life. Black radicals embraced him as the revolutionary avatar of black liberation in America and around the world. His posthumously published autobiography became a best-seller, and his legacy inspired numerous books, a U.S. postage stamp, a major motion picture and a Malcolm X revival during the early 1990s. In 2014 Malcolm X matters now more than ever. His political integrity and personal sincerity set a high bar for all future black leaders. His identification with, and love for, the black working class set an enduring standard. Malcolm didn’t just love black people—he respected them enough to challenge them, offering stinging criticism in some instances and gentle prodding in others. His wide grin, handsome face and fierce intelligence made him the most powerful speaker, leader and prophet that has ever come from what Ralph Ellison called “the lower frequencies” of black America. Malcolm’s transformation from prisoner to activist reminds us that America’s jails have been utilized by African Americans as sites of political struggle and intellectual achievement. Finally, Malcolm’s ability to boldly speak truth to power, no matter the costs and consequences, reminds us that we can afford to do no less at this critical, historic juncture. Peniel E. Joseph, a contributing editor at The Root, is founding director of the Center for the Study of Race and Democracy and a professor of history at Tufts University. He is also the Caperton fellow for the W.E.B. Du Bois Research Institute at Harvard University. He is the author of Waiting ’Til the Midnight Hour: A Narrative History of Black Power in America, Dark Days, Bright Nights: From Black Power to Barack Obama and the newly released Stokely: A Life. Follow him on Twitter.